Mobilink has formally collaborated with NADRA Technologies Ltd to facilitate payment of Utility Bills. This service will be available Free-of-Charge and around the clock. Deputy Chairman NADRA, Tariq Malik and Vice President Marketing Mobilink, Bilal Munir Sheikh inked the agreement to this effect. NADRA Technologies Ltd (NTL) has undertaken this innovative approach to develop an e-Sahulat billing switch to provide an integrated system response to clients for payment of utility bills through alternate channels like mobiles phones, internet, ATM, bank branches and telcos outlets. The facility will empower Mobilink retailers to accept and deposit utility bills from all Mobilink and Non Mobilink customers, even people who do not own a mobile phone can avail this service by walking into a Mobilink retailer’s outlet and depositing their utility bills round the clock, within the due dates. At the signing, Tariq Malik, Deputy Chairman NADRA said, "We are pleased to partner with the Mobilink which is the country’s largest cellular family with the most widespread retail and distribution network. Through this service, we are taking the bill payment facility to places where banks haven’t." He further emphasized that "e-Sahulat platform is a tip of the iceberg and NTL is in process of transforming this platform into National Smart Service Platform for e-commerce. Through this Smart Service Platform organizations can utilize e-Sahulat touch points for cash in and cash out transactions under branchless regulations issued by State Bank of Pakistan. This arrangement will help commercial banks and Telecom operators to extend branchless banking concept through e-Sahulat without raising any infrastructure thereby saving capital and operational cost." 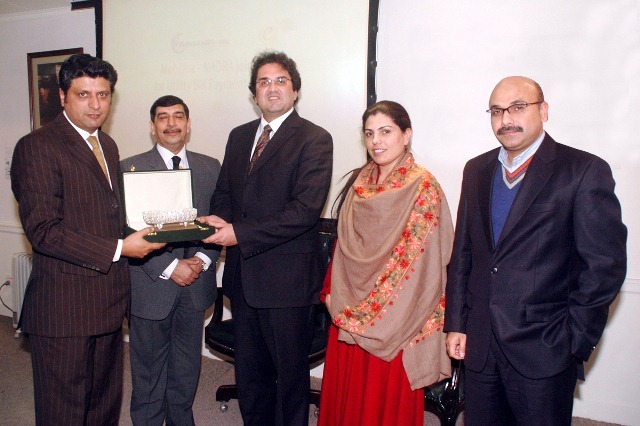 Bilal Munir Sheikh, Vice President Marketing, Mobilink commented, "We commend NTL’s efforts to reach out to the common people of Pakistan, a vision we are pleased to share with them. As there is no charge or fee associated nor any condition to own a mobile phone, all segments of the society can avail this convenient facility"
e-Sahulat is a truly enabling service that cuts across infrastructural barriers in line with the spirit of branchless banking. This arrangement once put in place will facilitate general public especially in rural areas with solutions housed in congenial environments, while exposing the public to state-of-the-art-technology. at last an end to the long endless lines! bill payment finally made easier! NADRA is going to start Money Transfer with the collaboration of Bank Alflah to offer Branch less Banking concept in Pakistan to felicitate people. NADRA Technologies Ltd (NTL) has to sign an agreement with PMCL that mobilink post-paid (indigo) bills can be paid at NADRA e-Sahulat points.